Teacher's Guide This link leads to a pdf document containing links to sections of the document. Each section describes various aspects of the module: a module description, learning objectives and questions for discussion, materials and resources, creation of the module, research and evaluation, dissemination, references, and module worksheets. 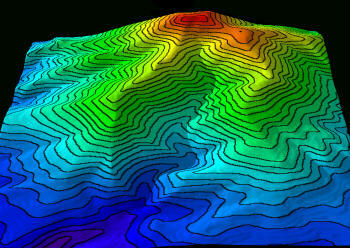 Content Guide This link leads to a pdf document that outlines the types of movies found in the module, descriptions of uses of topographic maps, and explanations and examples of contour lines and elevation profiles. Student Guide This link leads to a pdf document that is intended for students to read before using the module. It serves as a summary of the module and can help to facilitate independent student use. This document describes the types of movies in the module and what changes students will see as they watch or interact with each type of movie. Copyright 2001 by Stephen J Reynolds, Julia K Johnson, Carla McAulliff, and Michael Piburn. Developed as part of the NSF-funded Hidden Earth Project. Thanks to Debbie Leedy, James Birk, and Barbara Tewksbury. Use in educational settings is permitted as long as the source is acknowledged. Commercial use is prohibited.